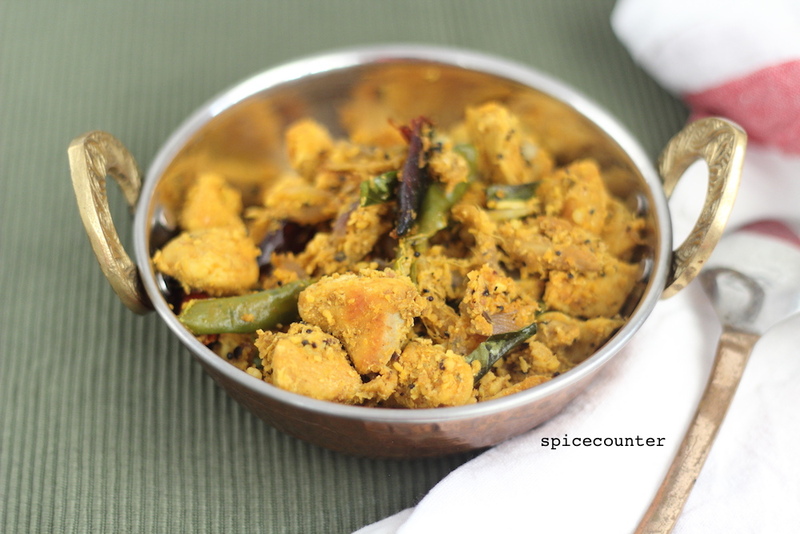 Chicken Thoran is a Kerala style stir-fry. Thoran is a south Kerala terminology for stir-fry. It is best had with piping hot rice & sambar. I usually make thoran (or upperi as we in central kerala call it) with vegetables. A while back i was watching this malayalam show called Annie’s kitchen and the presenter made chicken thoran which is chicken stir fry made kerala style (read it as lots of coconut and coconut oil). Those who like the taste of coconut will enjoy it but the others can replace it with regular vegetable oil. Those who understand malayalam can watch the show for the Recipe. The recipe is the same i have just altered the quantities around. Kerala style chicken stir fry. Best served with piping hot rice and sambar. Wash, clean and cut the chicken into small cubes. Add mustard seeds and once it splutters add the red chillies. Once it changes colour add the green chillies , small onions and half the curry leaves. Fry it a bit and then add 11/2 teaspoon of ginger paste and 11/2 teaspoon of garlic paste. Fry this onion mix till the onions become pale in colour. Now add the diced chicken, ¾ teaspoon turmeric powder, 1 teaspoon chilli powder, 1 teaspoon pepper powder & salt and mix well. Close the pan with a lid and let the chicken cook in the water it releases on low flame. In a mixer-grinder add coconut, ¼ teaspoon turmeric powder, ¼ teaspoon chilli powder, ¼ teaspoon pepper powder, ½ teaspoon fennel seeds and cinnamon and dry grind it till its fine. Once the water almost evaporates from the chicken add the coconut mixture and rest of the curry leaves to the chicken. Let the chicken cook till it is completely dry. Take it off the heat and serve hot with rice!